Yesterday Frank Webster and I discussed something I’ve been pondering lately…what would happen if we stopped charging overdue fines? 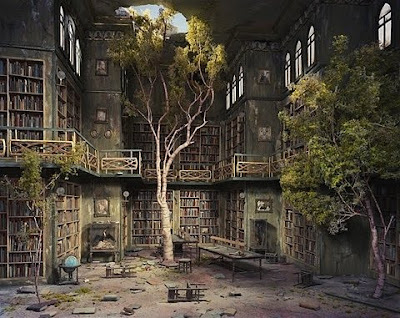 Would a flash-forward to 5 years from now reveal an abandoned library, empty of shelves and patrons, tumbleweed rolling through? Or would our stacks be full of happy, carefree patrons, free to spend their extra money in the café? I’ve done a little research in Library Literature & Information Science Full Text , subject tag “Library Fines.” There aren’t too many articles suggesting something so radical; in fact, there’s a survey included in a December 2005 Journal of Librarianship and Information Science article that collected a majority of almost 1,000 responses from Nigerian college students indicating that an increase in library fines was a good thing. 57 percent believed higher fines would “instill discipline” and 39 percent said it would “make library books available and accessible,” while a low 13 percent felt that high fines would discourage patrons from using the library. A February 2007 School Library Journal article proposed alternatives to fines for kids and teens. I’m not too keen on their suggestion to have kids work off their fines with duties like cleaning books, but I do like the idea of crediting $2 per hour for in-library reading marathons. I did find one academic library mentioned where this policy has been tested. Eric Roger Green, library director at Lamar Community College, writes of his library’s success in not charging overdue fines, which he says has made patrons more likely to use the library since they’re not being “punished” with a daily penalty. Green mentions something that would be essential at TC–we would still need to bill for replacements for long-overdue books, and I’d recommend we keep the fine system in place for reserves, laptops and recalls. The only way to know the payoff for sure is to try it out. What’s the worse that could happen? I'm sure it won't be this bad. Only 42 years overdue? How about 221 years late? We recall the recent story in Reuters about President George Washington who borrowed and never returned Emir de Vattel’s Law of Nations from New York Society Library. Overdue fees were calculated at approximately $300,000; staff at Mount Vernon, Washington’s home in Virginia, offered to replace the book with another copy of the same edition — leading to a celebration on May 19th in which the “errant volume” was returned! Fees forgiven, there lies a happy ending (or beginning) to this perplexing policy question.